Helicopter parent is a term for a parent who pays extremely close attention to their child’s or children’s experiences and problems, particularly at educational institutions. 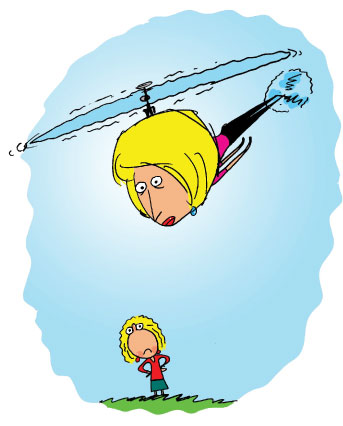 Helicopter parents are so named because, like helicopters, they hover closely overhead, rarely out of reach, whether their children need them or not. It is also called “overparenting”. Parents try to resolve their child’s problems, and try to stop them coming to harm by keeping them out of dangerous situations. This parenting style protects or denies the child’s activities to the point that the child is not exposed to risk and then cannot deal effectively when faced with risk. It can produce children that are burnt out and prone to break at the slightest stress when out of the house.